During bath time, Margot has taken to cleaning herself, mostly by rubbing soap on her legs. She has now translated this into house cleaning behavior. After dinner, she took a napkin and started rubbing it on the table and then on her toys. 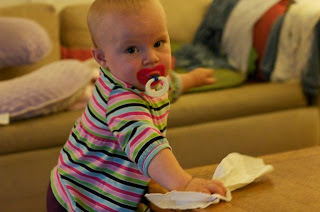 I'm not sure who has taught her this, because I'm not a cleaning role model, but I would like to thank whoever it was. If this cleaning thing becomes a habit, having a kid just got a huge plus added to the pro column!